But is the prank such a bad idea? Zurich and Copenhagen have banned diesel powered vehicles from their streets. Paris is considering doing the same in a few years time at least with Diesel engines manufactured before 2002. Once again diesel owners and manufacturers think they are being vilified by a “green” campaign. They do have a right to feel bruised though because 10 years or so ago diesel was sold to the public as an important brake to global warming The reason was because the diesel engine is more efficient than its petrol fuelled competitor and therefore produces lower carbon dioxide emissions from the exhaust. Well Oranges are not the only Fruit and CO2 is not the only airborne pollutant produced by petrol and diesel vehicles. The exact list of combustion products from them we might breathe in are almost countless. For some we divide them into general chemical families. For example nitrogen oxides, hydrocarbons (both short chain and long chain), oxidised hydrocarbons (like formaldehyde) and also the ubiquitous Particulate Matter (PM). This is always of very small size and found down to about 1/100th the width of a human hair or even less. Sometimes those primary toxic particles can actually be droplets of course. In culinary terms then, vehicle exhaust is a Bouillabaisse! A great deal is known now about the pollutants, additional to carbon dioxide, that are emitted from vehicles. And many of them have real adverse health impacts on the at risk population (young, old, asthmatics, heart disease patients etc). So it’s not just climate change and global warming effects that should have been “sold” to buyers of diesel vehicles because the levels of the extra pollutants are often much greater from them than from petrol fuelled cars. We actually find out more and more every month about our road transport chemical Bouillabaise. For example only this March a research group from the Wolfson Laboratory at the University of York made a potentially important discovery about the long chain hydrocarbon pollutants found in the exhausts. That is more of them are produced from diesel rather than from petrol vehicles. Why is that important? Well these larger hydrocarbons are efficient at “coagulating” to make the very small droplet/particles that we call Secondary Organic Aerosols (SOA). So even though particle filters fitted to diesel cars may be good for preventing primary PM pollution, diesel combustion will contribute more to secondary PM levels. 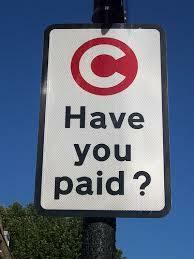 Sorry diesel car owners it may be time to really consider congestion charges in Cork City for you! The universal environmental protection rule is simple: The polluter should always pay or at least be dissuaded from polluting.